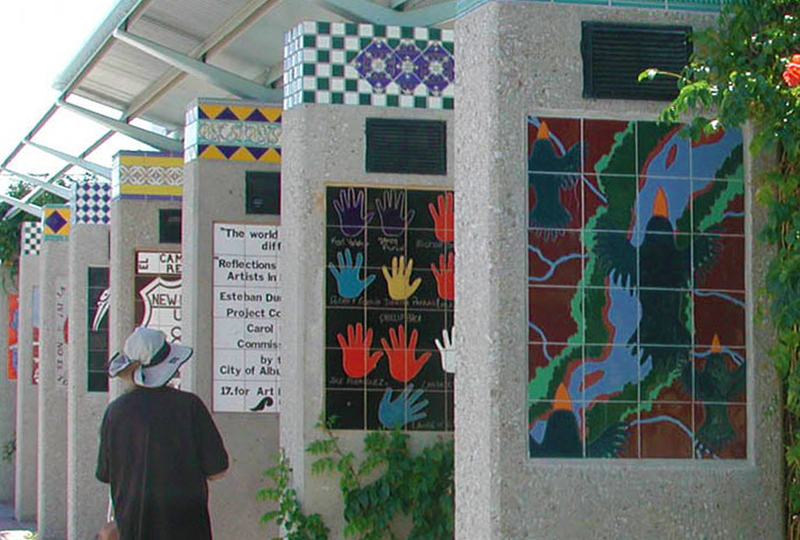 The west-facing mural depicts “Mi Jacalito” and includes signage from the commercial establishments along 4th Street, keeping alive the spirit of the old neighborhood and the importance of this segment of the Camino Real and the old Route 66. This area was once the home of a regionally famous café called “Mi Jacalito.” The east-facing imagery depicts the vest pocket park, the bus stop and a rendition of the neighborhood that emphasizes its residential structures. Duran has a long history of community involvement and has taught workshops in a variety of media for area youth and specifically Barelas-area youth. He has taught ceramic, tin workshops and graphics workshops rooted in his cultural heritage.